By the blessings of Allah (swt), Islamic Circle of North America (ICNA) has initiated a National Radio Campaign to inform non-Muslims about the beautiful message of Islam and to clear up misunderstandings regarding Islam. 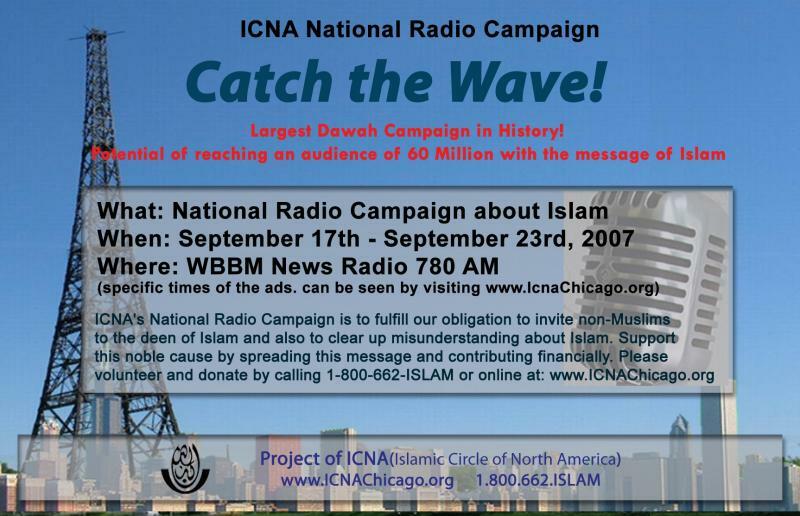 The National Dawah Department of ICNA is organizing this historic campaign where, approximately 425 Radio. Ads., of one minute each, will be played nationwide in 16 major cities. CBS Radio has been chosen to run these ads across the country. in the following sixteen ICNA Units. Below is a sample flyer from ICNA, Chicago Unit. All Units are encouraged to design and place a similar flyer on the home page of their local ICNA website.